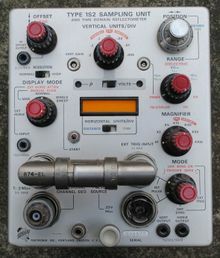 The Tektronix 1S2 is a sampling/TDR plug-in for 500-series scopes, introduced in 1967 and sold through 1972. Like the 1S1, it is a complete sampling subsystem and uses the mainframe merely as a power supply and low-speed X-Y display. The 1S2 outputs the Y-axis signal on plug-in interface connector pins 1 and 3 like other 500-series plug-ins, and the X-axis signal on the front panel, via a banana connector. The X-axis sensitivity of the oscilloscope mainframe is expected to be 1 V/div. Unlike the 1S1, the 1S2 contains pulsers that allows it to perform time-domain reflectometry (TDR) measurements. The 1S2 has two 50 Ω pulsers, one of which is active at a time. One puts out a 250 mV pulse with 50 ps rise time. The other puts out a slower 1 V pulse. The sampling bridge is a feed-through type. For TDR measurements, the signal from one of the internal pulsers is fed through the sampler, and out to the transmission line being tested. Returning pulses are detected as they pass back through the sampler, and they are reabsorbed by the 50 Ω impedance of the pulser. Waveform output can be to the CRT of the mainframe and/or to a plotter or low-speed data acquisition device via banana connectors on the front of the 1S2. The interface between the GR-874 connector and the printed circuit board is described in US Patent 3,426,311. The 1S2 contains an internal power supply producing regulated +19 V, -19 V, and -136 V outputs, derived from a power transformer whose primary voltage is the 6.3 VAC provided by the 500-series mainframe on pins 13 and 14 of the plug-in interface connector. The regulators use bipolar transistors for the feedback amplifiers and the output emitter-followers, and zener diodes as references.